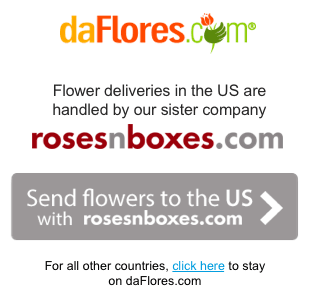 Send flowers to Argentina quickly and conveniently here at daflores.com. Flowers are an excellent way to show loved ones how much you care. Whether for special occasions, or to simply show affection, online shoppers can find the freshest, most beautiful blooms from local florists in Argentina. When you send flowers to Argentina with daFlores, you take advantage of the best. Our international florists in Argentina all have over a decade of experience, and are passionate about their work. We visit all our vendors personally to make sure we're on the same page. And, with bilingual customer service both online and by phone, you can trust daFlores to always get your flower delivery to Argentina perfectly right. Argentina is one of South America’s largest countries. It's a republic with 23 provinces and one independent city. We're sure you've heard of Buenos Aires, where Evita did her thing. If ever a lady needed roses it was she, but we have roses for your loved ones too. 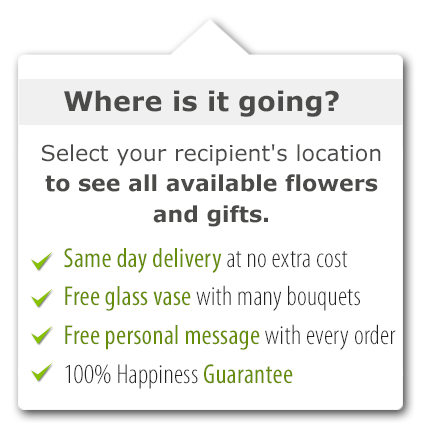 DaFlores only works with one florist in each major city or neighborhood. That way, we ensure our people concentrate on your flower delivery in Argentina. The available bouquets are sorted into easy-to-use categories by price and special occasion. Whether you need an arrangement for a birthday or a sadder occasion, the expertise of our florists in Argentina comes into play with just a few clicks of your mouse. Beautiful Argentina has lots of space and scope for growing stunning flowers. With the Atlantic on one side and the Andes on the other, you know there's going to be diversity. This is a developed country with lots of industry, but also places to grow. Modern industries include banking and trade, but the country's name speaks of a past firmly rooted in silver. The florists in Argentina have great raw materials Argentina borders the Antarctic and includes rich central plains and soaring mountains. You'll find oil here, and the kind of gold daFlores florists turn into your beautiful flower delivery in Argentina. Ranging from below-sea-level flats to the 22,841-feet high Cerro Aconcagua, the country is criss-crossed by numerous great rivers. All of this makes a wonderful environment for flowers to grow -- and how they do! Argentina's climate is more or less temperate, with areas of polar ice and tropical climates further north. (Remember, this is the southern hemisphere.) Sometimes it snows, and sometimes it's windy, but generally this is a fine place to be. Look for crocodiles, monkeys and flamingos...all are found here. When you send flowers to Argentina, you just add to the beauty. And yet, the people cluster together in Argentina. Ten large metropolitan areas hold half the population; less than a tenth of people live in rural areas. Because daFlores sets up florists in these major population centers, you can send flowers to Argentina for all your best celebrations. DaFlores is a family-owned company founded in 2000. We started with the Americas and are expanding all the time. That means we have a long history of flower delivery in Argentina. We know and love the country and our florists in Argentina do, too. When you send flowers to Colombia or Argentina with daFlores, you take advantage of years of experience, passion and delight from a company that literally loves what it does. We just know you'll love the result when you send flowers to Argentina with daFlores! 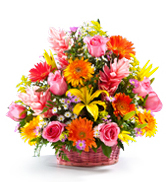 Same Day Flower Delivery to all cities in Argentina. Para ver esta página en Español, favor visitar nuestra página de Enviar Flores a Argentina.